Obituary for Betty J (Rickett) Blevins | McKee Mortuary Inc.
Betty J. Blevins, 81, North Manchester, went home to be with Jesus on January 11, 2019 at Miller’s Merry Manor, Peru, Indiana. 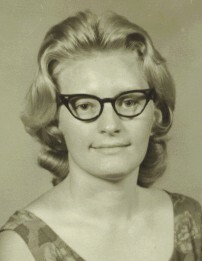 One of four children, Betty was born on September 13, 1937 to Edward and Ethel (Wood) Rickett in Logan, West Virginia. For the last 67 years, Betty has been married to her best friend Elmer Blevins. The two were married on March 19, 1951. During their time of marriage, Betty worked and retired from Controls after 30 years of service. When she got free time from raising the family and working, Betty enjoyed to relax by painting, going to flea markets and being a member of the Red Hat Society. Most of all, she loved being with her family and especially her grandchildren. Betty will be remembered for many things, but the most important to her and her family is that she was a great mother and a devoted Christian. A member of Manchester Bible Church in North Manchester, Betty loved going to church every Sunday, until her health started to decline. The loving memory of Betty J. Blevins will be carried on by her husband, Elmer Blevins, Peru, Indiana; three sons, Jason Blevins, North Manchester, Elmer Blevins Jr. Warsaw and Rick Blevins, Baltimore, Maryland; two daughters, Debbie (James) Justice, Wabash and Shair (Byron) Erickson, Three Forks, Montana; one brother, Bobby Rickett, Ohio; two sisters, Phyllis West and Ann Gallagher, both of Ohio; twenty-two grandchildren; sixteen great-grandchildren; and three great-great-grandchildren. She was preceded in death by her parents. Family and friends may call Saturday, January 19, 2019 from 10:00 a.m. to 2:00 p.m. at McKee Mortuary, 1401 State Road 114 West, North Manchester. Services for Betty J. Blevins will begin following the conclusion of the calling. Burial will be at Friends Cemetery, West Millcreek Pike Road between 300 West and 400 West, Wabash. Pastor Lane Lingofelter will officiate. For those who wish to honor the memory of Betty J. Blevins, a love offering may be made to McKee Mortuary, 1401 State Road 114 West, North Manchester, Indiana 46962 to help with final expenses.